We offer a full range of design and construction services to help you complete your next project. With our expertise in Timber Framing and Specialty Shell Packages, we are ready to partner with you to bring your vision to life! 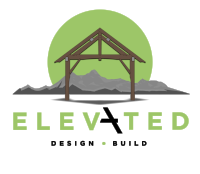 Elevated Design Build is a full-service design and construction company with over 60 years of combined experience in the design and construction of custom homes and timber frame structures. In that time, we have been involved in over 800 projects in 14 states and 4 different countries. We pride ourselves not only in the exceptional craftsmanship of our buildings, but in the way we operate our business. We are employee-owned and value honest and transparent communication with every one of our clients. Sound like what you are looking for? Give us a call!